John Smith's bitter have announced that they will shortly be offering drinkers the chance to own a share of 'Smithy', a 3 year old thoroughbred racehorse. 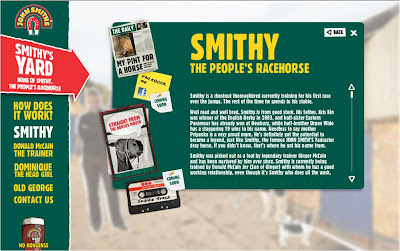 From January 2010 buying a pint of John Smith's in participating pubs will entitle the purchaser to register for a share in 'Smithy - The People's Race Horse.' Share holders will then be able to participate in Smithy's development through voting on various decisions as the season progresses. Everything is pulled together on a Smithy area of the John Smith's website at www.johnsmiths.co.uk/smithy. Here you can learn about Smithy's background, as well as meeting other important characters such as Dominique, Donald and Old George. Smithy, John Smith's real life racehorse, is now a couple of months into his second season and has progressed to novice hurdles. 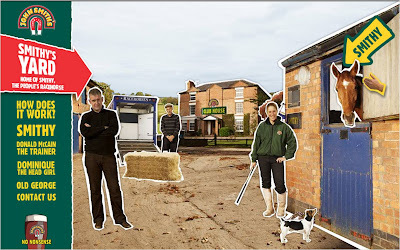 To celebrate, John Smith's have updated Smithy's website with a new look and better functionality. Consumers are encouraged to sign up to be shareholder and will receive a match bet and free trial subscription to Racing UK channel just for registering. There are also going to be over £50,000 of prizes and experiences on offer throughout the season via the website exclusively for shareholders so, don't delay, go to www.johnsmiths.co.uk/smithy and sign up today!